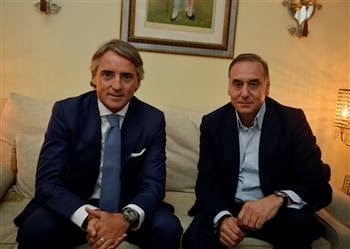 Finally, Roberto Mancini after talking to Galatasaray officials, since yesterday, will sign three year deal with Galatasaray! Most likely, former Galatasaray player who is well known in the European football , Tugay Kerimoglu will be Mancini's assistant . Robert Mancini was without of work since he was sacked at Manchester City since May ! Galatasaray will play their second match in the Champions League on Wednesday against Juventus ! Roberto Mancini will coach Galatasaray! Galatasaray have been talking with former Manchester City boss Roberto Mancini in Istanbul , Turkey . President Unal Aysal and chief executive Lutfi Aribogan have met with Roberto Mancini. Mancini, 48, has been out of work since being dismissed as City manager in May after a three-and-a-half-year reign at the Etihad Stadium which included a Barclays Premier League title success in 2012 and 2011 FA Cup glory. Fatih Terim was sacked as Galatasaray coach earlier this week after rejecting a contract extension. Terim, who is also in charge of the Turkish national team, was voted out at a meeting of the club's board of directors. Galatasaray will introduce Roberto Mancini to Galatasaray fans on Monday will probley hold a signing ceremonies on Monday too ! Most likely , Roberto Mancini will be there to coach Galatasaray . Besiktas was ordered by the Professional Football Disciplinary Committee (PFDK) on Thursday to play four home matches behind closed doors after its fans invaded and occupied the pitch in injury time in a match against Galatasaray. The anticipated decision came after an hours-long meeting of the PFDK, which reviewed harshest options to deliver a ban on Besiktas, the Black Eagles, in order to deter similar acts in the future. 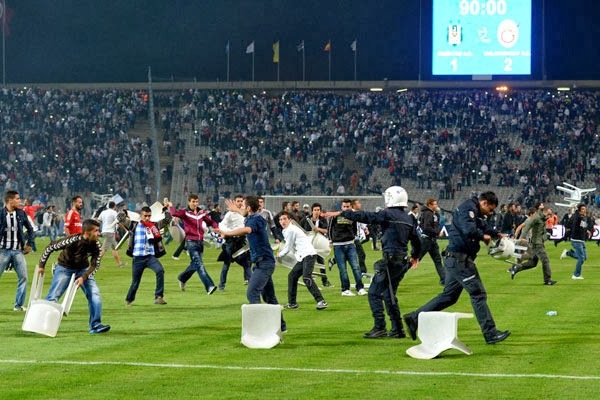 On Sunday, referee Firat Aydinus postponed the Turkish Super Lig derby between Besiktas and Galatasaray after Besiktas fans stormed the pitch, throwing chairs at Galatasaray midfielder Felipo Melo and clashing with riot police. Galatasaray led the match by 2-1 and the game was abandoned due to the invasion. Very sad to see the match end this way and these ugly pictures aired not only in Turkey but also in Europe and on international TV channels. Awful and ugly scenes in the Istanbul's derby match and then Galatasaray board of directors decision to show the door to Fatih Terim was shocking news after the derby match on Monday! Hundreds of fans running on to pitch with plastic picnic chair were awful scene to see ! Kasimpas after losing at home against Fenerbahce last weekend beat Sivasspoe in Sivas 1-2 ! They trashed Elazigspor at Kadikoy with four goals and Moussa Sow grabbed hat trick and Dirk Kuyt scored the other goal for Fenerbahce. Third place team Rizespor beat Bursaspor at home and kept up the pressure at top ! Antalyaspor and Gaziantepspor are onlytwo teams has not won any matches yet in the league. I really don't think he was let go because of poor start this season in the league nor getting trashed against Real Madrid in Istanbul ! That was the big mistake by a man who wanted to bring professionalism to Galatasaray! Both sides should have left their egos and communicate little better ! It would have been better if they did this end of last season after winning the Championship ! And, that is why he said yes to coach Turkish National team ! Terim's third spell ended at Galatasaray but his third spell with Turkish National team might be extended to four years now ! Fatih Terim's third spell at Galatasaray has come to a shock end, with the club deciding to part ways with Fatih Terim following a board meeting on Tuesday . Real Madrid might be blessed with some of the most expensive players in the world, but the Spanish aristocrats took an economical approach to dispatching Galatasaray in the two clubs’ Group B Champions League opener tonight, utilizing a potent counterattack before entering another gear to put the Lions to the sword 6-1. Galatasaray could feel aggrieved to have been down 1-0 at the half following an opening stanza full of energy and purpose in front of their supporters, but they could have few complaints about the ultimate result, as Real demonstrated the sides’ gulf in quality by hitting their hosts on the break before running up the score line once the Lions’ aggression had been tamed. Cristiano Ronaldo hit a hat-trick, while Karim Benzema added a brace of his own, in what turned out to be a humbling experience for Galatasaray despite pre-match suggestions that they could spring a surprise on the Spanish giants. Given that much of Istanbul is one large building site that has succumb to “urban renewal,” it is little surprise that even hell – a.k.a. the venerable and intimidating former home of Galatasaray at the Ali Sami Yen Stadium in Mecidiyeköy – has made way for the city’s latest luxury condos. But what Galatasaray’s new Türk Telekom Arena lacks in tradition, it certainly makes up for in size, and the 52,000 Cim Bom supporters did their best to create an awe-inspiring welcome, staging a giant tifo that featured coach Fatih Terim and his charges in medieval armor. Terim – who has frequently demonstrated that he did not acquire the nickname of “The Emperor” by coincidence – sent his warriors onto the attack from the off, with Felipe Melo testing Real Madrid just two minutes in with a rasping shot that stung Iker Casillas’ hands, but the unflappable Spanish number-one parried wide for a corner. The excellent save, however, was to be Casillas’ only meaningful contribution to the game, as the goalkeeper sustained an apparent rib injury that necessitated his replacement by Diego Lopez just 15 minutes in. Though Real was uncharacteristically garbed in all-blue, they reminded quickly the hosts of their credentials by nearly opening the scoring after Angel di Maria quickly evaded a sliding challenge in the box, only to curl his effort over Fernando Muslera’s bar. Melo was at the center of the action again on the half-hour mark, when his headed effort off a Wesley Sneijder corner seemed destined for the far corner, only to produce an excellent goal-line save by Lopez. The ever-mercurial Brazilian, however, demonstrated his propensity for picking up bookings within the minute when he was yellow-carded for fouling German international Sami Khedira. Gareth Bale’s multi-million-euro transfer to Los Blancos might have stolen the summer’s headlines, but it was another summer signing for Real, Isco, that soon found the sudden opening for the visitors in minute 33. Against the run of play and seemingly covered by at least three Galatasaray defenders, the Spanish international latched onto a long ball before beating Muslera off his right-hand post. The Lions were soon struck by their own rotten injury luck, as Champions League great Didier Drogba was forced to leave the pitch grimacing with shoulder pain just before the end of the first half, to be replaced by Nordin Amrabat. The sides returned to the contest with reckless abandon to start the second half, with Cristiano Ronaldo forcing a fine parry from Muslera, moments before Burak Yılmaz, who scored eight times in last year’s tournament, watched his free header flash agonizingly wide of Lopez’s post. being put through alone on goal. The goal opened the floodgates, and Ronaldo added a third and fourth within three minutes just after the hour mark, twice stabbing in from close range – with the second coming off a free kick delivered by Bale just after the Welshman entered the pitch. Ronaldo then turned provider with nine minutes remaining, passing for Benzema to score a second from close range. Umut Bulut might have earned the home side a modicum of respect by preventing Real from posting a clean sheet with six minutes remaining, but the goal was quickly overshadowed by Ronaldo, who smashed in from close range in injury time to complete his hat-trick and Real’s demolition of Galatasaray. Cim Bom singularly failed to produce another memorable – if futile – performance like they did when defeating Real 3-2 at home in last season’s Champions League quarterfinals, albeit while falling 5-3 on aggregate. The club will be subjected to another stiff test in its next CL date, when it travels to Juventus on Oct. 2 to meet the “Old Lady,” which was surprisingly held to a 1-1 draw away to FC Copenhagen in the night’s other Group B fixture. Galatasaray coach thinks and believes if Galatasaray players play with their hearts ,they could upset Real Madrid today ! "Real Madrid might be loaded with world best players and big salary players , my players will play with their hearts and 12th man on the stands behind them will make difference "
"They are very strong ,but we want to beat Real Madrid, in Ali Sami Yen Arena again "
On the other hand Real Madrid coach Ancelotti will set a record in Istanbul on Tuesday night. Ancelloti will head the sixth club in the Champions League in his career . Galatasaray beat Real Madrid last April in Instanbul 3-2 .. Both teams are unbeaten in their domestic league ,but Galatasaray has a few draw instead of wins! Galatasaray's biggest weapon will be Drogba tonight along with Sneijeder ..
Selcuk Inan coming out of the injury should be match maker for Galatasaray . I still think Galatasaray who plays in the big league does not have a real good second keeper in their roster! We saw that last weekend with Eray! The way he loped the ball in front of the goal was no no for a goal keeper..
That should be warning for Terim..
Gareth Bale and Ronaldo will be Real Madrid's weapons. Turkey still alive and kicking! Turkish national football team defeated Romania 2-0 in the away game in 2014 FIFA World Cup qualification group D for keeping its hope of reaching the World Cup, to be held in Brazil. Turkey won the game as Turkish striker Burak Yilmaz scored a goal in the first half and Mevlut Erdinc scored in additional time in the second half. To qualify, Turkey need to win the remaining two matches in group D.
After beating Angora at home last Friday with 5-zip score , they are aiming to win their last three matches in the Group D and looking for some help a long the way by Holland to beat Hungary ! Dream is still going on , Terim, says ..
After really bad start in the group with Abdullah Avci, Turkish Football decided to bring motivator and father like figure to many players on the team , Terim to coach remaining four matches. At the press conference today, Terim said, he could see the excitement and courage from his players eyes .. He said , my players ready to play and give their best on the pitch on Tuesday . Romania is in first place in the Group D and a draw will be enough for them.. But, a draw will kill Terim's and his boys dream on Tuesday! Terim gave a flash interview to FIFA. COM , web site here is what he said there . FIFA.com: Can you describe your emotions about returning as Turkey's national coach? Fatih Terim: My principle has always been to respond positively when national duty calls. Therefore, whenever I believe there’s such a need and my employers approve such a role, I have no second thoughts of responding positively to the call. After receiving the offer from Turkish Football Federation, I approached the matter with this philosophy and the result is that I’m now in charge of the team. What are your plans for the team? What needs to be changed? Unfortunately, Turkey's recent results have fallen below expectations. Certainly, we are in a position that we don’t desire. But instead of making changes in the current team, I think we need to modify the base of the system and our youth development setup. It will be vital to implement the right project with the help of experts in these areas. However, our main priority is the Romania game and we are fully concentrated on that. How would you evaluate the current situation in Group D? Do you feel that Turkey still have a chance of qualifying? Instead of evaluating this matter on the basis of luck, it will be more reasonable to fulfil the needs of complex mathematical calculations in our group. Of course, achieving the impossible has always been my target but what we are chasing is a miracle now, and I am aware that performing this miracle depends not just on time but also several other factors. My aim is to ensure that our fans can watch entertaining performances from very talented players who can achieve anything if they really believe and work hard for their goals. For that reason, if we prepare well, work hard and reflect those efforts on the field, I am fully confident that we can achieve our miracle. I will certainly put all my efforts towards this and pray for it to happen. Where do you believe Turkey currently stands in world football? And what is the team's potential? Turkey have already shown what they are capable of with their past achievements and established their position in world football. With all my heart, I believe that we have significant potential. However, raw potential won’t deliver the results you need. What we need is to properly handle our talent and to combine smooth physical and psychological performance with world-class technique and tactical knowledge. In other words, processing the talent in the way it deserves and making it sustainable. Do you think this current Turkish generation can follow in the footsteps of the generation that finished third at the 2002 FIFA World Cup Korea/Japan? Unless the world stops turning and the football industry stops developing, no two generations will be identical. Despite having common values, players who grew up in different cultures and conditions should be trained and handled according to their own generations. The 2002 generation played with great commitment and self-sacrifice and the 2008 crop were very ambitious. The 2013, 2014 and 2015 generation will be seen in a different way. Turkish National team won against Andorra in 2014 Fifa World Cup qualification group D in hopes of reaching the World Cup, to be held in Brazil in June next year. Fatih Terim's boys need to win all of their remaining three matches and hope for miracles in group D.
Fatih Terim started his third spell with a win but he and his boys will face first place Romania in Romania on Tuesday . That would be real test for the Terim's boys ..
Turkey has to win their remaining three matches and hope for miracles from other teams.. Chances are still very slim for Turkey !